InThrMa EMS (Energy Management Suite) saves you time and money by harnessing the intelligence of the cloud to help you manage your HVAC portfolio. Fully customize your HVAC system to meet your objectives and rest assured knowing that you won't be blindsided by equipment failures, runaway utility bills or other surprises associated with HVAC. Reduce energy bills with InThrMa EMS's adaptive thermostat optimization technology. Reduce the amount of time spent managing and optimizing your HVAC assets. Be alerted to equipment malfunctions or system inefficiencies. Connect your external events or booking calendars for automated HVAC programming. Compare your HVAC portfolio to national performance metrics. Control your thermostats from any web browser or smartphone. Generate custom reports that chart your usage over time and identify HVAC performance problems early. Upload reference documents and access them while servicing/inspecting equipment (manuals, troubleshooting guides, floor plans, etc). 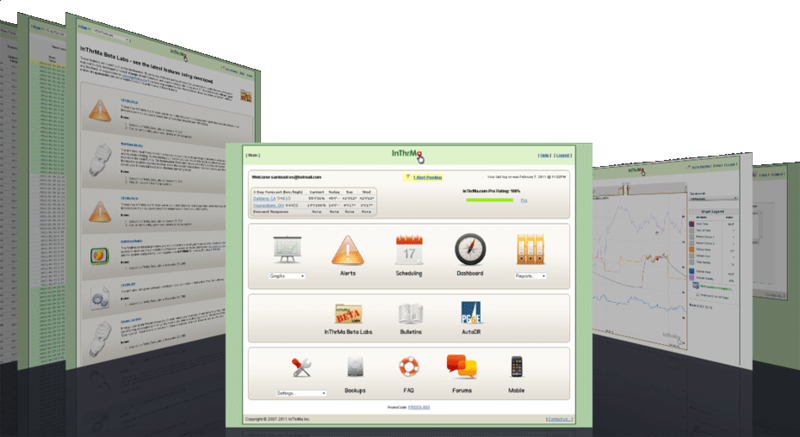 Do you want to program your HVAC systems from a single web dashboard? InThrMa EMS is an ideal tool for modernizing your HVAC system without replacing the entire system. Do you want to manage your HVAC systems remotely from your smartphone? InThrMa EMS iPhone and Android apps allow you to monitor and adjust settings while on the go. Do you use a web based calendar (Google, ServiceU, etc) to schedule events for your facility? InThrMa EMS connects with your calendar to automatically program your building temperatures around your events. Do you want to control lighting and other electrical devices (pools pumps, aux ventilation, signage, etc)? Use InThrMa EMS compatible devices allow you to switch electrical devices from the same web interface. Do you want to receive alerts when certain environmental conditions occur? Use InThrMa EMS to set alerts that monitor your environmental conditions. Do you want to see graphs and reports on your HVAC system performance? InThrMa EMS graphs and reports help you visualize and understand how your systems operate and interact and are an excellent way to discover problems that you didn't know existed.